"For 550 years we have been fighting to conquer all under Heaven. I'm the 32 king in the Qin line. Now Heaven is smiling on me. I've conquered three kingdoms already, only three remain: Yan, Chu and Qi. When I have conquered them all I will cease to be a king. I will be the first Emperor." From the creators of Farewell My Concubine, Raise The Red Lantern and To Live comes The Emperor's Shadow (aka Quin song), a story of power and frailty, conquest and submission, and the struggles which gave birth to a nation. Set against the events that established the first Chinese dynasty is a story of lovers caught between their desires and the obligations of tradition. Opening circa 222 BC, China is divided into seven monarchies at constant war with each other. This is a time of extreme brutality - prisoners are routinely beheaded when towns are captured. 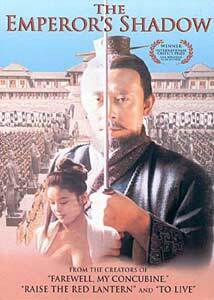 Ying Zeng (Jiang Wen), king of the Qui, is driven to unite China and become its first emperor. Through battle the first kingdoms fall, but Zeng knows that conquering of the body alone will not bring his people together. He believes that a national anthem must be composed to capture the hearts and minds of his country, and only then will he attain the peace that has so long been missing. He calls on his childhood friend Gao Jianli, a man who has become China's greatest composer in the 26 years that have passed since they last saw each other. Separated as young boys, they were raised together while Zeng was a captive of the rival Yan monarchy. Zeng's previous requests for Jianli to join him have gone unanswered, so Zeng sends his army out to overthrow the Yan, and bring the composer to him. However Jianli has no respect for the vicious conflicts helmed by his former friend. He defies the king's request and proves a difficult guest, attacking his guards and staging a hunger strike that brings him close to death. Only the interference of Ying Zeng's eldest daughter, crippled since childhood, brings the musician back to life, and back to a purpose. The two fall in love, despite her betrothal to the head of the king's army - a pact that will not be broken. The conflict this creates within the king's family and his council isolates the man whose goal is the unification of his country, and underscores the scope of the task he is destined to undertake. This film is epic in its proportions and production. I would hate to guess how many thousands of extras were used to populate shots of the armies riding on horseback. Although the film chronicles an extremely brutal period in China's history (for example, when an assassin fails to kill the Emperor-to-be, he orders everyone in a three mile radius executed!) the focus of the film is not on the battles that form the backdrop for the story. There are several scenes depicting the routine treatment of captives - beheadings and brandings of their foreheads, but these don't make up the majority of the film's content. Instead we follow the struggle Zeng undergoes with his personal feelings for Gao Jianli and his daughter, and the conflict their relationship creates between himself and his council in the looming path of history and tradition. The characters are portrayed without being overplayed - Gao Jianli's character is the hardest to accept, though he endures branding, hunger strikes and a host of other tortures. Lu Gengxin's cinematography is beautiful, whether depicting the massiveness of Zeng's armies or the interiors of Jianli's domain, with light filtering through blinds and latticework. Images are strong and well composed, perfectly capturing the magnitude of the events the country is going through and the contrast of the internal conflict threatening the foundations of the Emperor's family. There is very little to find fault with in the production, and the presentation on this disc really does the film justice. While I highly recommend the film, I would caution that the depictions of brutality and some very descriptive sexual dialogue would not be suitable for children. Image Transfer Review: The Emperor's Shadow features a number of subjects that if handled improperly can end up looking a mess on DVD: smoke, vertical blinds, lattice work, intricate patterns, and long shots of stairs all lend themselves to aliasing, interference or compression problems with disastrous potential. Fortunately, this disc suffers from none of these issues; in fact, it really excels in their presentation. The image is beautifully stable throughout, with no sign of abnormality anywhere, even in the most challenging compositions. Colors are vibrant or subdued as appropriate for the scene, and black level and contrast are solid. This is one great looking nonanamorphic transfer, and the removable yellow English subtitles are within the 1.85:1 frame, allowing widescreen owners to maximize their viewing size without losing the dialogue. Well done! Audio Transfer Review: Audio is presented in ProLogic Surround. Aside from a few dropouts this track suits the program perfectly. There is not a lot of surround activity, but the frequency range is full. The opening scenes at the banks of a gorge thunder, as do the huge ceremonial drums used throughout the film. The dialogue is in the film's original Mandarin Chinese. Extras Review: Filmographies for the principal cast and a page of production credits are available from the main menu, as is the theatrical trailer. I would have liked at least some production notes included, but we don't even get an insert card with chapter listings, just a couple of advertising pieces. Also, for a film this length, 8 chapter points are not sufficient. A magnificent, though often brutal story. The presentation is top notch here. This is truly an epic film, beautifully crafted, well acted and strongly written. For anyone interested in historic dramas, I would give this a very high recommendation.